Sleeve Gastrectomy Dallas, Texas | WLS Surgical Associates, P.A. Expected Weight Loss: 70% Excess Body Weight Loss at 1-2 years; long term data is favorable. The gastric sleeve has become more popular as a standalone procedure because of its simplicity. At its core, the procedure simply removes 85% of the existing stomach pouch, leaving a banana-shaped “sleeve” that restricts the amount of food that can enter the stomach. This restriction allows for gastric sleeve patients to lose significant weight while minimizing post-surgical complications. In years past, the gastric sleeve was used as a preliminary procedure to a full gastric bypass for patients who were severely obese (BMI of 60 or over). However, because of the exceptional effectiveness of the gastric sleeve procedure, it has become a widely accepted alternative to gastric bypass and gastric banding. PLEASE NOTE: Until recently, Medicare, Medicaid and many private insurance carriers did not cover the gastric sleeve as a standalone procedure. Now, many insurance plans have begun to accept the gastric sleeve, therefore we suggest you contact your insurance company to verify your benefits. You can also contact our office to discuss your insurance options with one of our insurance/billing specialists. EXTREME OBESITY: If a patient has a BMI greater than 70, then the patient might be a candidate for this operation to lose some of the weight prior to Gastric Bypass. 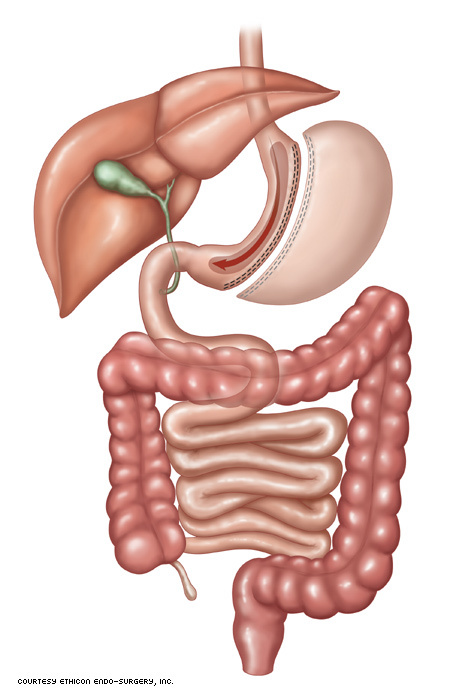 EXTENSIVE PRIOR ABDOMINAL SURGERY: If a patient has extensive adhesions of the small bowel, it might be impossible to free them up in order to move a part of the small intestines up to the small pouch. These patients might be reasonable sleeve candidates. SEVERE MEDICAL PROBLEMS: If a patient has severe liver disease, heart disease, or lung disease, this procedure might be a reasonable to attempt to decrease the extent of surgery. AFRAID OF BYPASS AND NOT INTERESTED IN THE BAND WITH NEED FOR ADJUSTMENTS: This is an occasional request of patients with lower BMI’s (35-50), who want to consider this newer technique. MEDICAL ISSUES – DIABETES (ON INSULIN): If you are on insulin, then the sleeve might NOT be the right operation for you. These patients are typically more assuredly cured of diabetes with a Bypass. MEDICAL ISSUES – SEVERE REFLUX (HEARTBURN): If you have nightly heartburn and have developed complications from chronic acid reflux, then you might have ulcers or narrowing or dysfunction of the esophagus. These patients do NOT make good Sleeve candidates since the condition can be more thoroughly cured with a Gastric Bypass.